Countless factory workers churn out bullet after bullet in an industrial warehouse. On her knees, a young girl screams her innocence before shooting herself in the head. The crowd standing around just lets it happen. Her limp body is thrown onto a cart. Yan might be dead, but she has left a curse. Men scrub her message off the wall, but unease remains. “The phantom bullet will kill you all”. The Bullet Vanishes is a murder mystery with a hint of the supernatural and a generous helping of the police procedural. Set in the late 1920s in China’s Warlord era, a series of murders have been happening in an arms factory owned by the sinister, scarred and slightly over-acted Ding (Liu Kai-Chi). The girl from the opening scenes, Yan, was accused of stealing a case of bullets, and as per factory rules, Ding “let the heavens decide” – through a game of Russian roulette. The murders began two weeks afterwards, and with no bullets left behind, the workers begin to suspect that Yan’s promise is coming true. Sent in to investigate are policemen Dong Lu (Lau Ching-Wang), and Guo Zhui (Nicholas Tse). This film is going to struggle to shake off the term “Sherlockian” – not that it’s a really bad thing. The era and costuming lines up with Sir Arthur Conan Doyle’s vision and in terms of its cinematography it is slick with a nostalgic filter and bears more than a fleeting resemblance to Guy Ritchie’s recent Holmes franchise. It would be easy at this point to stamp the main characters as simply amalgamations of more famous ones. Dong Lu could be half Sherlock, half Ichabod Crane. Guo Zhui, the “fastest gun in Tian Cheng” could be a little bit Watson, a slight amount Poirot and a whole lot of Wako Kid – minus the tremor and alcohol. Hey, even the name of the film sounds like it was plucked directly from Agatha Christie’s mind. However, the film and the characters manage to stand on their own, giving what could have been a sad, formulaic echo a depth and originality beyond what I expected. Dong Lu’s silences suggest an interesting and possibly tumultuous past that is never elaborated on. The complexities that make up Guo Zhui could probably sustain a textbook. The plot is interesting and thoroughly gripping most of the way through. It is set in an era where police are corrupt, workers can be forced to stay in a factory against their will, and is not shy about tackling violence and dark themes. There is also possibly more Russian Roulette in this film than in all other films combined. Ever. While strong in both plot and acting, towards the end it seemed as though the writers got a bit too excited about the prospect of “twists” and let loose. I’m not sure if there needed to be a fire, crossbow, shootout, autopsy, emu and hanging all within the space of half an hour but dammit it was pretty to look at and well executed so what the hell. The Bullet Vanishes is definitely worth a look. It sells itself on the plot alone, but if that isn’t enough, the costuming, sets and action scenes should definitely keep you away from The Nap Zone. You’ll like it if you’re a fan of Agatha Christie, Sherlock Holmes, murder mysteries, munitions, the 1920s, attractive men in fedoras, or enjoying life. If that isn’t you, there’s always the option of staring at a drawing of a stick figure frowning unhappily from its place in a grey background. 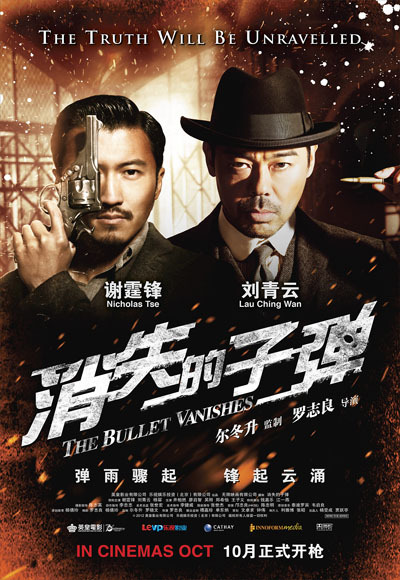 This entry was posted in Film, Reviews and tagged Lau Ching-Wang, Nicholas Tse, sherlock holmes, The Bullet Vanishes. Bookmark the permalink.